As Mama and I sat together in the living room and rehashed our day to find the joy, we realized that it was highly productive but rather boring. “I’m pretty sure I’ve already written a post like that,” I told Mama. Four years in on this daily #OneGoodThing project, it is getting harder not to duplicate. “You know, like de-ja vu,” she adds. I could not stop laughing. And after a long day of physical and mental challenges, it was exactly what I needed. Today’s #OneGoodThing was a productive but boring day with Mama — ’cause life has repeats! 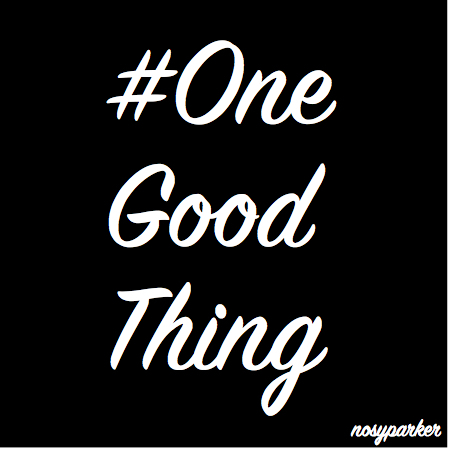 What was your #OneGoodThing today? Please share in the comments! Day 43 of 365. And Day 1,139 in a row (here’s the first 366, & the following 365, & the third year of 365 good things)! Yup, life repeats, sometimes the good bits, sometimes the bad. My biggest Life Repeat is Joe St. Clair. We were sweethearts from 1958 to 1961 and then parted ways, he to France and I to Southern CA. The repeat started in 1998 with a Christmas card from France, then a Valentine in the spring of 99, then a visit by Joe to my home in May of 99, then my visit for two months to Joe’s place in France, then a repeat summer stay in France…then marriage in Nov of 2000…and we are still sweethearts today.